When Voltage First Discovered The Chaos Emeralds & The Use For Them. Every Time She'd Go Near One She'd Start To Feel Funny. She Couldn't Explain What's Caused The Feeling. All She Knew Was The Chaos Emeralds Had Great Power In Each One. So She Thought To Herself. 'These Must Be Very Special. But What Are They Doing Here. What Are They?" She Didn't Quiet Know What They Were...Yet. Until Later On She Met Eggman. She Then Found Him Then Eggman Noticed What She Was Holding. She Was Holding The Fourth Chaos Emerald In Her Very Own Arms. Then She Began To Ask. "Do You Know What This Is?". Eggman Knotted Then Began To Explain To Voltage. That These Chaos Emeralds Had Great Power In Them. He Then Told Her That That Was The Fourth Emerald. Voltage Was In Shock She Didn't Know They're Were More Of Them. Eggman Said 'They're Are Only Seven Of Them'. 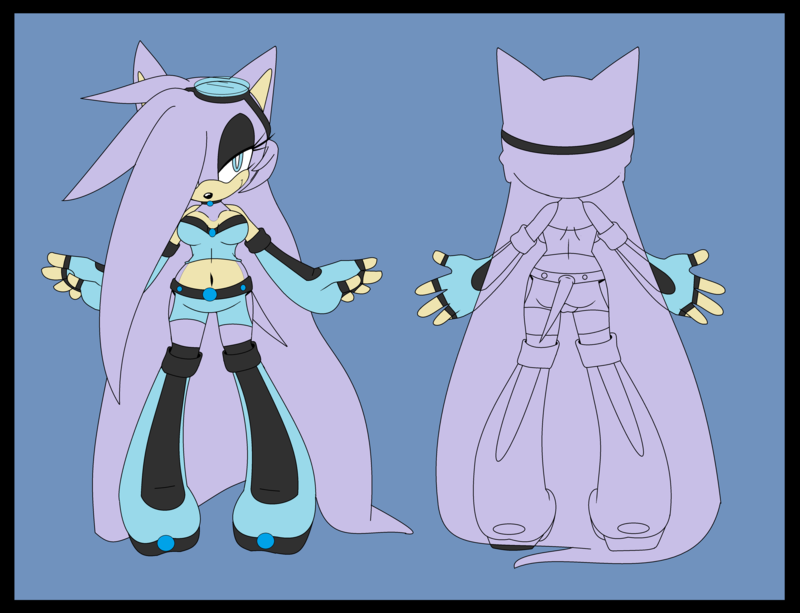 Voltage Some How Earned Eggman's Trust And She Then Joined G.U.N. Where She Met Rouge And Shadow. They All Went On Missions Together. Years Past And Voltage Was Starting To Like G.U.N. But She Got The Tingling Feeling I Think She Was In Love. Voltage Was In Shock She Was In Love...In Love With Shadow. She Felt Proud And Great. Until She Came Accosted A Blue Hedgehog And He's Friends. And That Moment Forward She Knew They're Never Gonna Become More Then Friends. But Just.....Rivals.
.: About Voltage That You Prouble Don't Know :. You Maybe be keeping your distance on her eyes. And wondering is she blind? The Answer Is "yes" She Is Blind. But it Does Not Mean She Can Not See. She Can Still See But Not With her eyes but with her mind. She can also her from very far away for about only 100 miles away. It's just her ability that makes her do those things. She also has the ability to feel strong power from the chaos emeralds. And Voltage Normally Doesn't Dress Like That. She's Not From Earth. She Used To Speak This Cretan League. But Her Master (Teacher sort of more of a master to her though) Taught Her How To Speak English. She Was Born...11/10/1996...November 10, 1996 ;Mobius. She Just Wears That Outfit So People Don't Look At Her Strangely. You Know So She Can Be Safe. Her Life (Of How It Began Will Come Shortly Either In A Comic Or Story Later On).